Please allow up to 3 business days for order processing. The expected delivery date is provided by the carrier automatically based on origin, destination, and drop-off time (IE: 1 to 3 days for USPS Priority). Since the expected delivery date does not come from Damage Industries, we can not control exactly when it is delivered and does not come with a money-back guarantee. Once a tracking label has been created, you will automatically be emailed with tracking information. It is the buyer's responsibility to contact us for shipping insurance and signature required deliveries before placing your order. Online orders are not charged a handling fee. We are required to charge Indiana residents 7% sales tax. Sales and specialty items are only available as advertised - no substitutions. Sale pricing is not available outside of specified sale periods. We reserve the right to refuse sales and services to anyone for any reason we see fit. Damage Industries offers a limited lifetime warranty on all Damage Industries-built products against manufacturing defects that may render the product unsafe or inoperable, to include cosmetic defects from the factory. As many other manufacturers have noted, due to the daily variations in black-dye anodizing tanks, slight variations in color are normal and expected. Should you find any of the above issues with your Damage Industries products, we will repair or replace the product at our discretion. We understand you may be waiting on more parts before you start assembly on your rifle. That’s why we give you 90 days to contact us for returns! Test/dry fitting is permitted, but returned or exchanged items must be in unused condition. Unused condition is non-fired, non-permanent assembly of parts. No drilling, filing, sanding, painting, locking compound, etc. You must obtain a RMA number to return or exchange your order. Visit the Returns page of our website or email sales@damageindustriesllc.com for a Return Merchandise Authorization prior to returning your item. Returns must include any accessories, manuals, and documentation that were shipped with the product and may be subject to a restocking fee of up to 20%. Exchanges are not subject to restocking fees. Restocking fees are assessed on an individual basis. It is recommended that you return merchandise with a carrier that offers tracking numbers and full value insurance on the parcels. Damage Industries is not responsible for any packages that are lost while being shipped to us. Custom products, special orders, and items sold "blem" or blemished, surplus, "as is" or "used" are not elligible for return or exchange. Sales Tax, Shipping charges, and FFL fees are non refundable. Merchandise from other manufacturers is warranted through the original manufacturer; no warranties are expressed or implied by Damage Industries. Product prices listed on our website do not include shipping and handling, which are calculated prior to credit card authorization and will be reviewed by the customer before checkout. Damage Industries shall not be liable for any damages that result from the mis-use of or the inability to use the materials and/or products on this site. If a Damage Industries product is mistakenly listed at an incorrect price, we reserve the right to refuse or cancel any orders placed for products listed at the incorrect price. 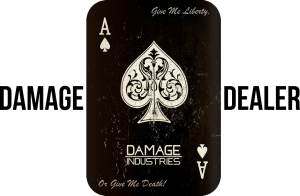 Damage Industries reserves the right to refuse or cancel any such orders whether or not the order has been confirmed and your credit card charged. The entire content of this site, including but not limited to text, graphics or code is copyrighted as a collective work under the United States and other copyright laws, and is the property of Damage Industries, L.L.C. The collective work includes works that are licensed to Damage Industries L.L.C. All Rights Reserved © 2016, Damage Industries, L.L.C.